Your first trip through a Stormgate from the Tradewinds Skyway to the The Tierra Primata Skyway can be enchanting and exciting. Stay on the lane and you’ll be transported into the Spanish themed world of Monquista! There is much to do here and quite a few folk to talk to. So get ready for some running around in fun and battle. When you land at the docks the first person you’ll see is your old friend Prospector Zeke. He has another Quest for you to undertake. One of the first thing you should do when you arrive is spend some time talking to the vendors to upgrade your accessories and equipment. 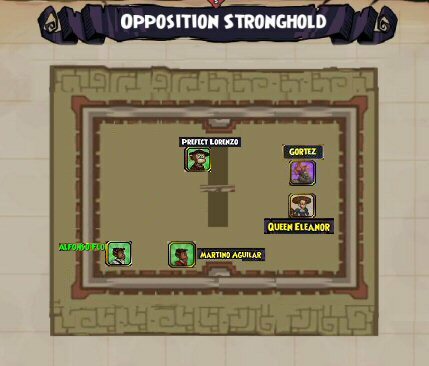 You can add a lot of health, attack, shielding, agility, dodging and so on through these upgrades. It really is worth the price of gold. And don’t forget to run around see who else may have a favor to ask of you. The king inside the palace isn’t the only person who needs a helping hand. 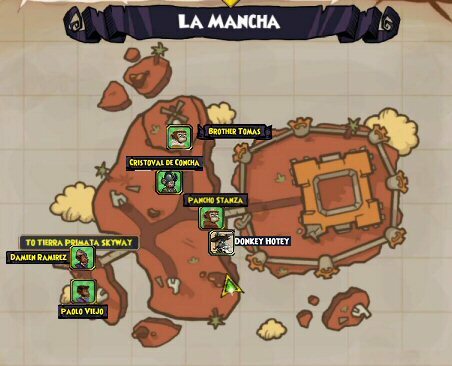 There’s much to do, so let’s get started on your journey through Monquista! 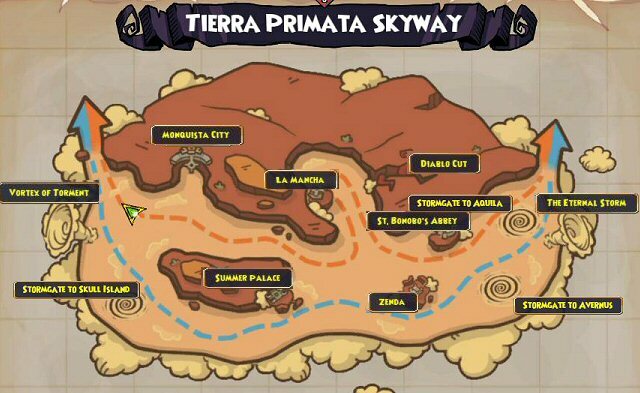 The Monquista skyway is an interesting place. Be careful cutting across the sky from windlanes however. There are some nasty critters and ships out there. On your first visit you’ll meet with the king and queen who will give you a small quest. The real thing to do here is meet with the folk outside the palace, talk to Zeke and upgrade your wares. You’ll come back here several times over the course of your travels to Monquista. 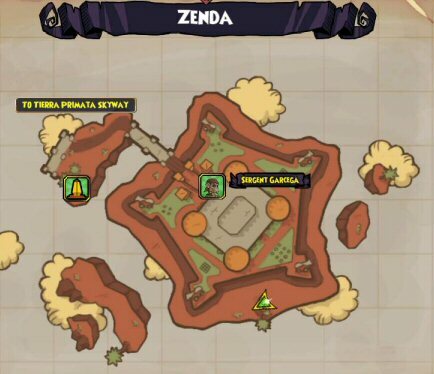 Zenda is the Monquista Prison and you’ll be sent to deliver Gortez to the guards there. Before you take care of Gortez however, run around the back of the outside of the prison to get the lost king. Then talk to Sergent Garcega. 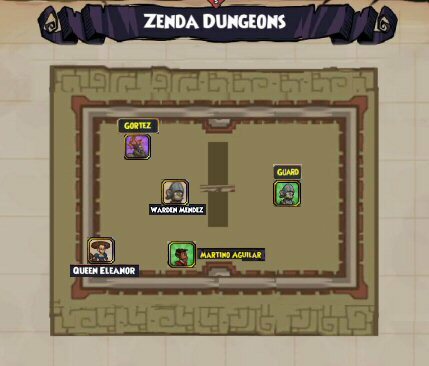 After you take Gortez to the dungeon, the warden has some unfortunate news about you. War makes strange bedfellows however and once you have protected yourself, you’ll find out some interesting information here at the prison. So make sure you talk to the other prisoners before you leave. On your second visit to the Dungeon a few things have changed and there are a few more people to visit with. Take time to pick up your new quests. Here you will find a lot of folk who need your help, make sure you run around the Abbey square and talk to everyone you find willing to speak with you. Check out the Tavern as well, it’s the only one here in Monquista. You can check out the area behind the Abbey, but you won’t be able to enter the tower until you’re sent here by Queen Elenor to talk to her sister-in-law. You can still run up to the tower and find the Lost King though. Queen Anna doesn’t have much to tell you, but she does give you some information and tells you to talk to her sister-in-laws. 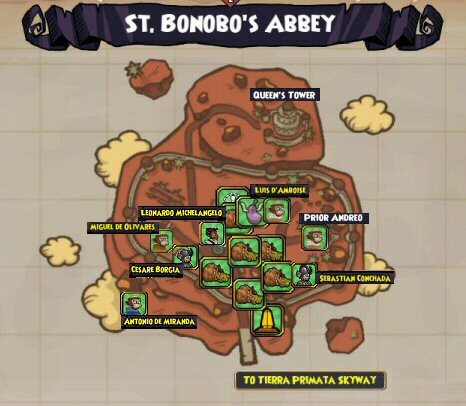 The Abbot will give you the next clue for your quest and direct you to location of the next queen. 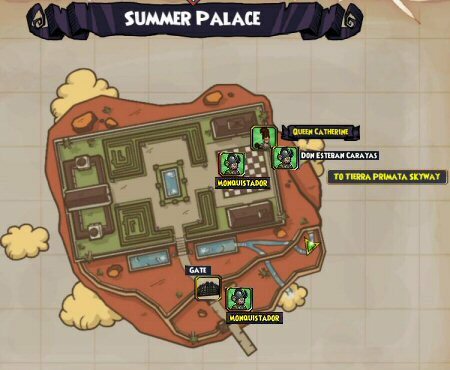 The Summer Palace is a dungeon. It will take about 30 minutes to get through it. Once again you get to sneak into a palace through the sewers. Ewe yuck! You won’t get into the palace without a fight however. But they’re manageable. 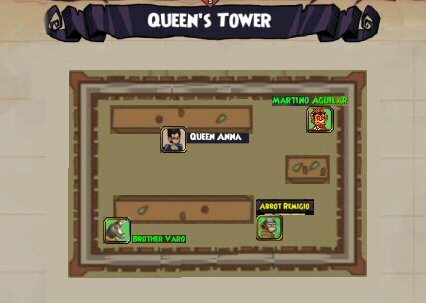 Once you talk to Queen, she will send her last faithful soldier with you and you’ll pick up a new crew member. Say hi to Don Esteran Caratas. You’ll make a couple of visits to La Mancha. In one of those early visits, look for the lost king. When you receive the quest to find the Monkey’s Paw, you’ll meet the main people you need to talk to. 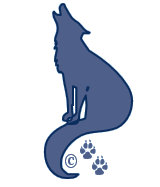 Namely you’ll find out the story behind what happened to the paw from Pancho Stanza. 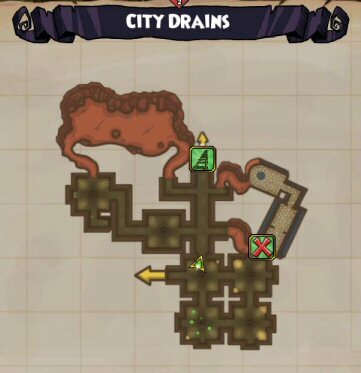 The City Drains are a dungeon. Pancho Stanza will send you to the library through a secret passage. You’ll have a few battles to get through here. But it’s a typical maze that requires you to flip a few levers to get to the next room. So you’ll have to defeat the enemies to gain access to the levers. This is my favorite trip back to Monquista City. 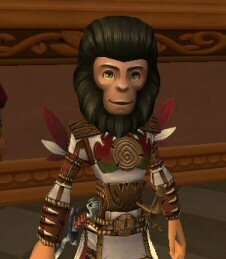 It includes a slight change of appearance which helps you acquire a certain book as part of the quest for the Monkey’s Paw sceptre. Sadly you don’t get to keep the mask, but it sure does look good. And yes it does seem very familiar. Once again we see our modern culture weaved into the storyline of the Pirate spiral. I love that! I think it enhances the story line and creates an air of familiarity and connection to what’s going on within the game. I think the mask looks most like Dr. Zira from the original (and best) version of Planet of the Apes. I can’t wait to see what the boy mask looks like. Perhaps he’ll resemble Dr. Cornelius. 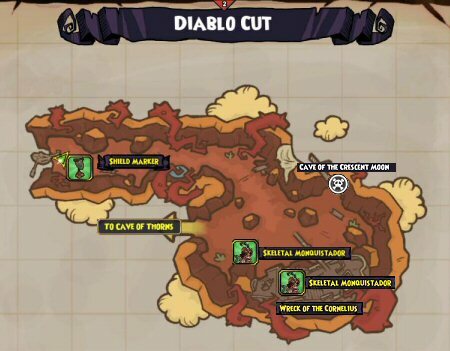 There are three parts to Diablo Cut. The first part that you’ll visit are the Docks and they are on their own little island. The most you’ll do on the docks (so far) is to find one of the lost kings. 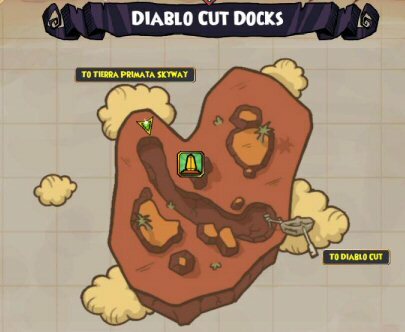 When you receive the quest to visit Diablo Cut itself, run across the island and you’ll find a small dingy that will take you over to Diablo Cut itself. 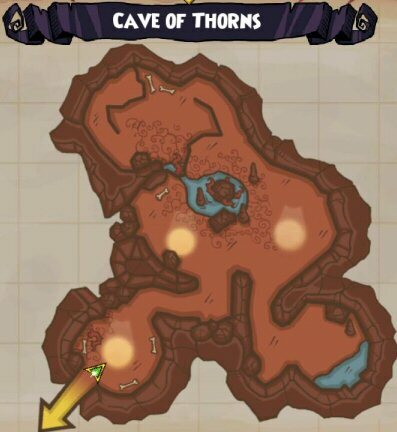 If Subodai is one of your companions you maybe sent to the Cave of Thorns. 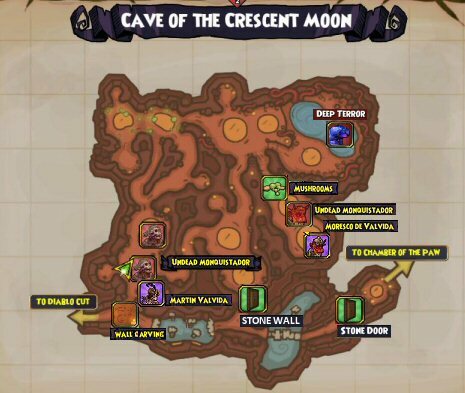 At this point it’s the only quest that has taken any of my Pirates to this cave. The quest for the Monkey’s Paw will send you to a secret entrance to the Cut. But those monsters present in the first visit won’t be present when you come back on the quest to find the Monkey’s Paw. Here you learn about the Valvida Brothers and the tragedy that befell them. 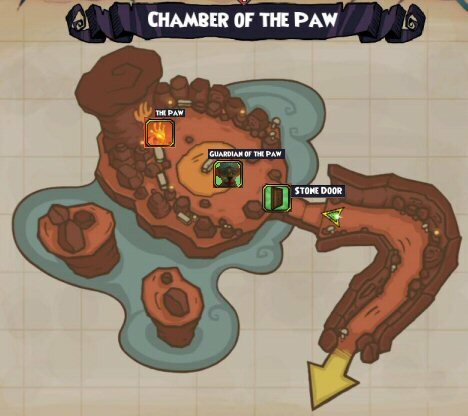 You’ll need a few cannon balls to help you gain entrance into the Chamber of the Paw, but if you stay to the edges of the wall you can pick them easily. After you blow up the stone wall, you’ll be able to reach the hall to the stone door. Use the three keys you acquired to open the stone door. Once you have entered the Chamber, you’re done with fighting. Grab the paw and teleport back to the Life stone. Once you acquire the paw you’ll take it back to La Mancha. The remainder of the story is sort of anti-climatic. But sometimes that’s the way a tale ends. 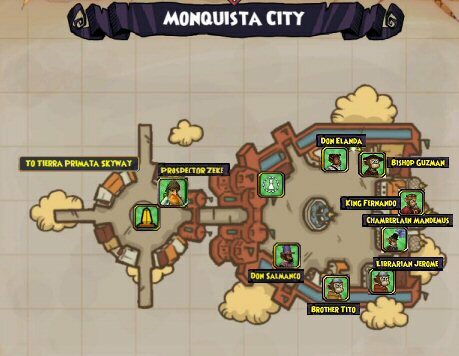 You’ll complete a few tasks for the sake of communication, but then you’ll go back to Skull Island to complete the mission that took you Monquista in the first place. Make sure you clear out all your quests before you move onto Valencia. 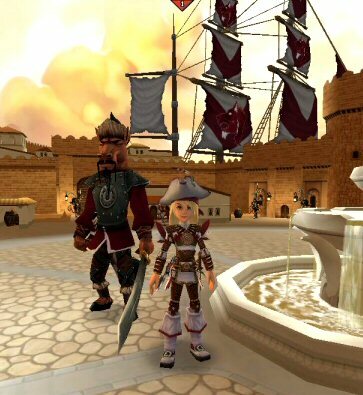 Those quests will help you level up and gain both personal and ship experience. You will definitely need those once you’re in the new world. Most importantly a couple of those extra tasks will help you acquire the crystal for the Stormgate to Valencia.